A couple of days ago I was in the garden with my notebook, trying to clear my head about the weeds in The Hump. It's funny how difficult a task weeding can be, mentally. And so I explained in detail why it was so weedy. I wrote lists filled with alarming question marks. I wrote dozens of droopy sentences, trying to clear a pathway through the problem. At such downhearted moments the application of chemicals is even one of the options. Aargh! Well, I am proud to report that I've got it sorted. I've ditched the nasty toxic stuff (which is just not in my gardening nature). And I am not going to copy all my sad scribblings into this journal. They are far too negative, and will doubtless encourage similar styled responses (for example : one isn't getting any younger, perhaps one's garden is just too big, and had one thought about downsizing, and so on). No way! The solution has been to clear a pathway, literally. My new path, edged with logs, cuts the Hump into manageable chunks. 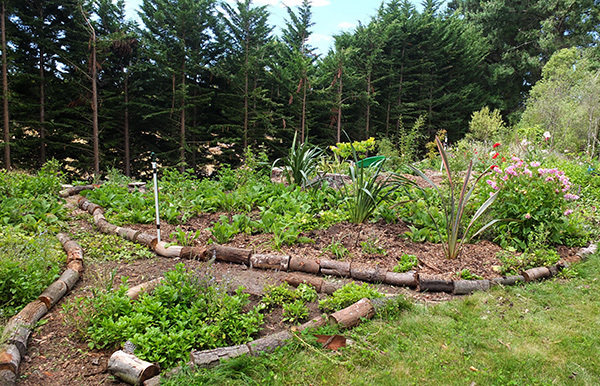 I've almost finished weeding and mulching one of the new areas thus created. I haven't cleared the actual pathway yet, though. Ground cover Lamium is well-represented in here, but that's easy to deal with. I've chopped off the tops of large Alkanet plants, leaving the roots. Alkanet, a perennial 'forget-me-not', not only acts as a rough and tough ground cover (and this is to be a rough and tough garden) but it provides winter and early spring food for the bees. It will definitely resprout through the mulch. Alkanet is indestructible! This newly defined area is not for roses. 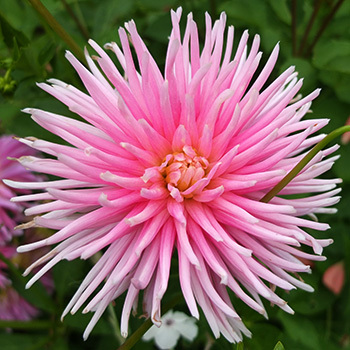 It is to be shrubby, apart from a collection of dahlias and spring bulbs on the lawn edge. They're already in. Any more roses I 'rescue' will be grouped together in the Hump rose garden, further along. As if these mass weeding exploits aren't enough, I've also been helping with the log splitting. 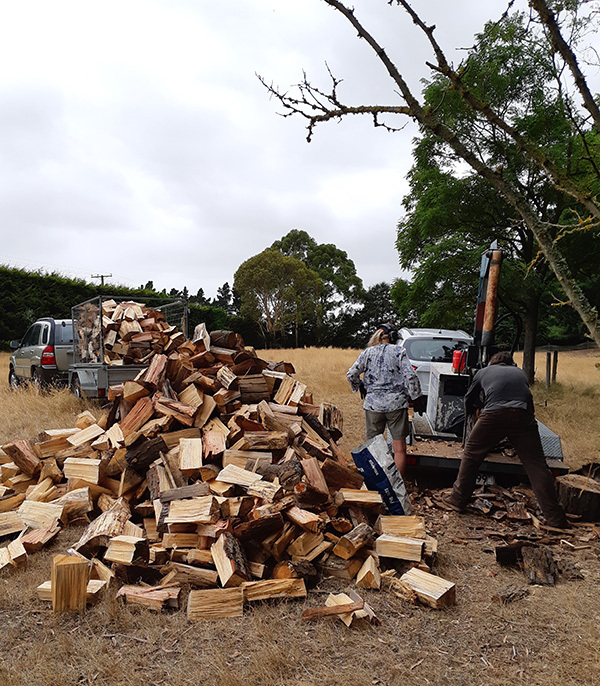 This week I've worked for eight hours at this rather physical activity, which always occurs in mid-summer, when throwing and stacking firewood has absolutely no relevance. And obviously on a relatively cool day. It's hot work! Good morning to my new computer! Yeay! The keys are less clunky, the alphabet letters are visible, so I can type faster. More time for gardening, hee hee. And good morning to the loveliest morning. Pebbles the dog, my young border collie who initially caused me so much worry, is gently playing hide-and-seek with the two new kittens, Red Fred and Black Fred. Very gently, for a dog! The kittens hide underneath the big rug, Pebbles snuffles around them making friendly dog-noises. Aha! This morning I dug out three sad Phormiums, two sad rhododendrons (labels 'Unknown Apricot Pink Seedling Lot 30'), and a sadder Maple, all trying to grow in shady, out-of-the-way, far-too-dry places, and failing. The poor Maple tree had virtually no roots at all. I divided the flaxes, pruned the rhodies, and plopped everything in my large water container. And this afternoon I planted them all, very carefully and thoughtfully, in The Hump. Artistically, even - the Phormiums in a soft sweeping arc, the rhododendrons tucked in on the shadier side of the path. I watered and mulched. And I did more weeding. And such an improvement! 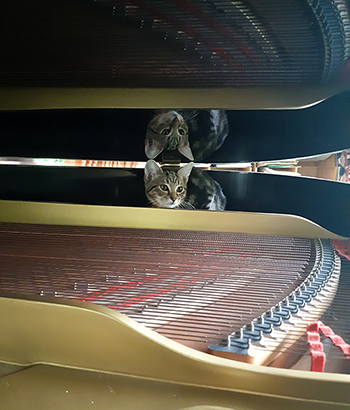 I kept having visits from the kittens. Had to stop weeding and scoop Red Fred up quickly. Otherwise he'd decide he wanted a smoochy cuddle, and try to climb up my legs to reach my shoulder. Here he'd purr into my ear and rub my nose. Hmm. Ouch!